MagnaTiles® Clear Colors 48 Piece Deluxe Set - Valtech Co. 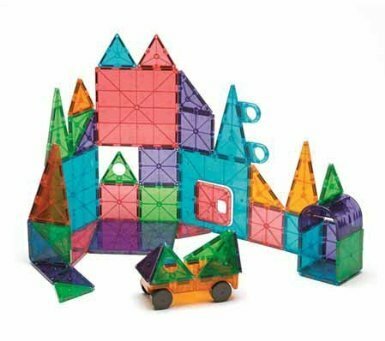 This set of clear colored Magna-Tiles® is unique to any other set with the additional accessory pieces. The added hinged door, hole punched triangles, arch, wheeled chassis and more allow creative building and play. 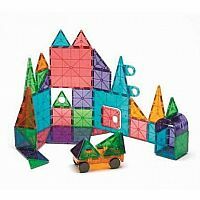 Use flat Magna-Tiles to create castles, trucks and any 3-D object that you can imagine! It is a great set to add to any classroom or home collection. All Magna-Tiles sets are compatible and endless geometric shapes and activities are possible. Magna-Tiles are unique and attract on all sides, even when flipped around. Children will learn through play and exploring shapes, symmetry and other basic math concepts with these colorful pieces!